Founded after the Norman conquest in the 1070s by William de Wavenne who was awarded the land by William the Conqueror. 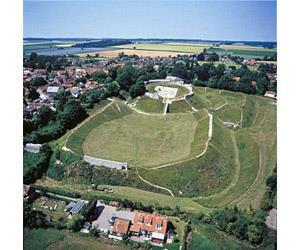 Although there is not much built stone left the earthworks are still very impressive and together with the priory and walled town of Castle Acre comprises one of the best examples of Norman estate planning in the country. Take the A10 to King's Lynn. From King's Lynn station it is 20 miles to Castle Acre Castle.